A group from Santa Rosa came down for 2 days fishing with 3 Anglers. 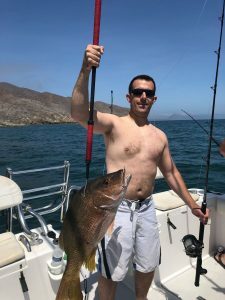 They fished one day in close by the islands and then toughed it out the next day to head through some winds to arrive well offshore to a special spot. This first trip out with 3 anglers we encountered some green water and decided it would be better to fish the island and rocks for other species. 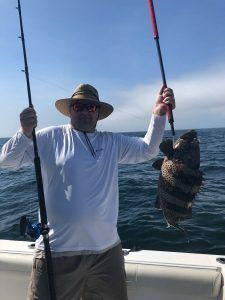 We did have some luck with some decent grouper and a handful of other nice fish. The next day we headed further out offshore. This day was rough to start with annoying winds which made for a long tough ride out to the fishing spot where we expected blue water. 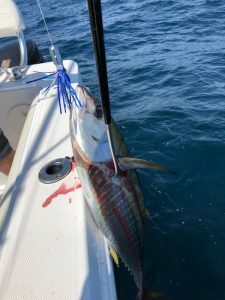 When we arrived we did not immediately find fish but found some decent yellowfin dropping some irons. It was a little slow at first, but with the help of a single bird in the distance we found the tuna and ended with 25 yellowfin on the day for only 3 anglers. That is fishing in Mag Bay. By no means was this a great trip, in fact our goal is Wahoo, Dorado, Tuna and marlin, but in these conditions and this cool water we were happy to keep their rods bent until it was time to come home. So far a little slow start to the season for some species …but not all. The water outside the bay is green and still abnormally cool. At about 68-70 degrees it is definitely far below the norm for this season. But further out at the Thetis and other banks there is blue water, though still a little cool. As it warms we expect some amazing fishing, and hopefully a late season perhaps into January or February.